A lot has happened to me after returning from the Consortium of Multiple Sclerosis Center’s (CMSC) annual meeting, so I was happy to find some free time to finally go through the pamphlets I collected while I was there. As I walked around the Exhibit Hall at the event and spoke to each exhibitor I knew in the back of my mind I wanted to share what I learned with you. I was impressed with the dedication and commitment of each exhibitor; they work hard to help the MS community. MotherToBaby: I was impressed and in awe of MotherToBaby, a free service from the non-profit Organization of Teratology Information Specialists. MotherToBaby offers up-to-date medical research and so much more. Their staff of experts are available to answer questions about, for example, medications a mom may need to take or products they are thinking of using. Since 1987 experts in the field of birth defects speak to mothers, family members and health care professionals about their concerns. From the safety of medications to abuse of alcohol and drugs, MotherToBaby is available to answer all of your questions. You can find them online at MotherToBaby.org or toll-free at (866) 626-6847. This is a truly wonderful organization. 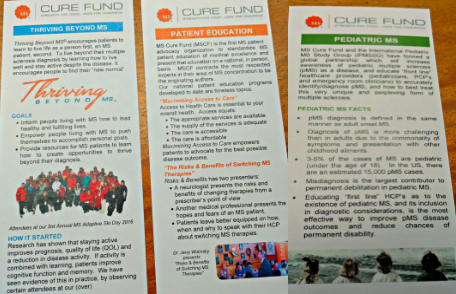 The MS Cure Fund: According to their website “The MS Cure Fund is a national non-profit organization. It was started by MS patients to put a face on the disease, create awareness through educational seminars, and raise funds that go directly to Multiple Sclerosis research. It is dedicated to help eliminate this debilitating disease with the hope to find a cure.” You can find them online at MS Cure Fund. MS-GO: I was already on the mailing list of MS-GO before leaving for Maryland. It’s a great resource to find out what MS events, support groups and meetings are taking place in your neck of the woods. Simply sign up for free to receive a calendar of events in your state. I love receiving my weekly calendar in my inbox! Go to multiplesclerosis-go.com. NARCRMS: NARCRMS is an acronym for North American Registry for Care and Research in Multiple Sclerosis and is a special project of CMSC for patient and physician-reported outcomes. NARCRMS is an ambitious, highly collaborative effort between MS registries, research investigators and patients to synthesize actual data collected from patients to aid in the design and conduct of clinical trials. “The registry will allow stakeholders to freely access de-identified data. NARCRMS will be the first open source database to link North American MS Centers in the U.S. and parts of Canada.” You can check out NARCRMS yourself at narcrms.org. AllCare Plus Pharmacy: I wasn’t familiar with this specialty pharmacy so I took their pamphlet to find out more about it. The pamphlet says that AllCare Plus offers “World Class Multiple Sclerosis treatments available from your trusted specialty pharmacy.” They consider themselves patient centric by offering a unique plan of care developed for every MS patient, medication and disease state education, clinical pharmacists available 24/7, monthly wellness checks and direct enrollment into manufacturer sponsored programs. For provider support they claim their average turnaround time for a completed benefits investigation and prior authorization is less than 2 hours. You can reach them at 1-855-880-1091 or online at AllCarePlusPharmacy.com. Let me know what you think. They teach patients about MS, help them explore treatment options, direct them to valuable resources, empower them to live full lives and connect them to a supportive community. I wish this was around when I was diagnosed! You can reach them at (800) 637-0522 or online at TurnFirst.org. International Journal of Multiple Sclerosis Care: Before I go I want to let you know about a magazine I’m completely devoted to and I think you should check it out, too. “The International Journal of MS Care is the official peer-reviewed publication of the Consortium of Multiple Sclerosis Centers (CMSC). It was also adopted as the official publication of two sister organizations: the International Organization of Multiple Sclerosis Nurses (IOMSN) and the International Organization of Multiple Sclerosis Rehabilitation Therapists (IOMSRT). It is published bimonthly…and contains peer-reviewed articles in areas of interest to multiple sclerosis health-care professionals.